Kailstig the Axe is a Nord member of the Undaunted who can be found at The Fish Stink tavern in Davon's Watch. You can join the Undaunted at any level by speaking to him, although it is advised to be at least level 10 before completing the quest given by Kailstig. After completing the quest you have to return to him to be properly initiated into the Undaunted. He will tell you about Fungal Grotto, marking it on your map if you have not yet discovered it. You will meet him again at The Withered Tree in Riften, where he will tell you about the Blessed Crucible and Selene's Web. 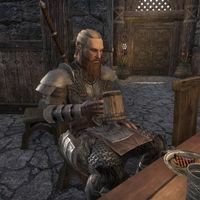 Kailstig can also be found inside Hel Ra Citadel in Craglorn, where he will ask you to explore the citadel. Once you have completed The Missing Guardian Kailstig will additionally be found inside the Star-Gazers' Observatory, where he offers the same quest. Speak to Kailstig to join the Undaunted. "By the Divines, the ale servers in this place get uglier by the day." I'm looking for a fight. "Ha! Is that right? Well then. Sounds to me like you could be one of the Undaunted." "A league of like-minded adventures. Every one of us eager for riches and glory. Sound like anyone you know? So what do you say? Think you can be one of the Undaunted?" Yes, I want to be one of the Undaunted. "You sure? Dungeon delving and monster fighting is not for the weak of heart." "Good, but that's the easy part. The hard part's proving yourself. Fungal Grotto I seems like a good test. A dark, dank cave few return from. See if you can best whatever's inside. If you survive, come meet me back here and we'll make it official." "Well scamp, you don't look any worse for wear. Maybe you should put the ale down every once in a while and pick up a sword. Hah!" After duly completing the test at the grotto, return to Kailstag. "Well look at this! If it isn't the scamp I sent to clear out a dung heap. Hah! Going get a little rough for ya scrap? Sure took you long enough!" "This is a gathering of the Undaunted, and you're about to become one of us! Hope your ears are ready to bleed ..."
Kailstig the Axe: "Pull it together mutts, we've got a new scamp that's ready to risk life and limb for glory." (? ): "And I say we welcome the scamp as only we know how!" (? ): "I could always use an assistant—or a scribe to record my exploits." Felvyn the Swordarm: "I think the new blood could help me in the privy. I'm not supposed to lift anything heavy." (? ): "You're looking pretty light from here, Felvyn. I propose a toast to the newcomer!" (? ): "Hear, hear! A toast!" (? ): "Aye, a toast and a song!" (? ): "To those who fall in battle to the new scamp. How shameful it must be—to look upon that ugly face as the last thing you see." (? ): "To those who fall in love with the scamp! For they have sacrificed so much, for so little." (? ): "To the new scamp's blacksmith. Unused swords rarely need repair!" (? ): "Fine toasts one and all! Now for the song!" (? ): "Not bad - for a bunch of half-wit drunks. Hah!" Kailstig the Axe: "Take pride in being Undaunted, scamp. Your deeds will live on long after your body fails." You can then talk with Kailstig again to finalize your membership. "What're you looking at? The song's over." "And we're done! You are now one of the Undaunted. Divines help you." "That's all there is to it! Welcome to the fold, scamp! You may one day have as many notches in your axe as I do. Aw, who am I kidding? No you won't! Hah!" What do I get for being one of the Undaunted? "What do you get? How about unending glory? A life of pride and satisfaction? That good enough for you?" "Indeed! Undaunted always ask for more! More danger, more treasure! But we take care of our own—we know how to fight, and we'll teach you, if you stick around. We have an armoury—and we'll arm you, for a fee—if you stick around." "What should you do? You're Undaunted! Go kill something! Something big! And let all Tamriel know of your exploits!" Any dangerous creatures about that I can kill? "Heard a rumor that some Goblins in Varanis took over a cave; been causing a nuisance for some Dark Elves. Place is called … Fungal Grotto. You may find your adventure there. Goblins for sure." "What's this? Another motley band come to steal my glory? You don't have the guts!" "They say something terrible has awoken—or occupied—Hel Ra Citadel, abandoned by the Yokudans since they invaded Tamriel. Scholars have been disappearing inside since the door to the Citadel, sealed by the Yokudans for thousands of years, opened." "I was set to adventure with the Undaunted—to explore Hel Ra Citadel in the mountains. However, my fledgling allies—newcomers, all of them—entered without me. Probably thought it was funny. They never returned." What's happening at Hel Ra Citadel? "Something awakened in the Citadel—or took residence. We Undaunted decided to find out what, and I still mean to. Whatever it is, it's fierce. Undaunted don't just disappear. "I welcome such a foe!" or "I came here searching for anyone else willing to go." I'll go first. / I will go to Hel Ra Citadel. If you are inside the Citadel, Kailstig will warn you, "Keep a note on if you're going out there. Write where you would like to be buried. I'll do my best to carry your body there, if I find it. What? An army of Undaunted vanished out there. I'm not morbid. I'm a realist." What do you know of Hel Ra Citadel? "It's been silent since the Yokudans invaded back in the First Era. Supposedly build during that time. Until recently, that door behind you was shut, either by sorcery or craftsmanship. None could best it." "The door opened. Many came. Some Redguards grabbed stones from this chamber, claiming pieces of their ancestral home. But something out there started grabbing the Redguards and scholars. Even members of the Undaunted." Any idea what awaits me in the Citadel? "An enemy worthy of the Undaunted! We heard the crash of armored marching echo out of the walls, and the blast of an immense warhorn, but silence has fallen since my friends entered. It would take a savage dragon to quiet that many Undaunted." You didn't see your foes? "All I've seen is the inside of our traveling packs. The others left without me when I was checking our equipment. It wasn't funny at that centaur graveyard in Elden Root, and it's not funny now. I hope a Yokudan ghost ate them." Tell me more about the Undaunted. "We're the most daring group of adventurers to ever leap into boots! Bane of beast and Daedra alike! The fiercest brigands this side of Sovngarde! Some of us also enjoy disappearing into ancient Citadels, leaving the Nord in charge behind." If you are at the Star-Gazers' Observatory and took the quest, Kailstig will sound impatient, "Then what are you still talking to me for? Get to Hel Ra Citadel before all the good fighting is done. And if you see those fools who left me behind, tell them I said to go to Sovngarde. And not to enjoy themselves." Why are you here in the Stargazer [sic] Observatory? "I heard rumors that one of the Celestials themselves has taken mortal form and wanders these halls. I would like the chance to fight her." "I'll admit, I thought you were a goner when you went inside, but glory goes to you—for now. Once Roaring Ramavel and the other Undaunted get here, I'm taking it right back. I'm the best!" If you are on the Trials leaderboard for Hel Ra Citadel by the end of the week, Kailstig will be the author of the mail containing leaderboard rewards that you receive. For Your Dauntless Deeds at Hel Ra Citadel! "I told the miscreants here about your dauntlessness at the Citadel of Hel Ra. We all agreed you deserved something special to use against the dangers you court! Because who knows where your thrill-seeking will take you tomorrow? At any rate, I thought I'd have one of the greenbacks send you something from the armory. Hope this gets to you in one piece. We make the greenbacks jump off a lot of roofs for the fun of it, so no guarantees! I wish I could convey my bellowing laughter in this letter, but, alas, I am no poet. I'm not even a warrior poet. I've paid an Elf in coin to write this letter for me. This page was last modified on 20 February 2019, at 02:29.